yes its very tough to get recommendations for everybody..who are coming from other place..its terrifying...if you get any info plz share to me...dr aravind 7358286729...thanks in advance..
Hi finds, wen the application form will be issued for 2016-2017 batch?? You can get admissions even without recommendation. No transfers are made from KKN to Sirusseri. hi frnds, Please help me in knowing what are all the required documents needs to be attached during the application form. Since i don't have cc for my kid. Also we have telephone bill and passbook as address proof. Will they accept this ? Refer Last year discussion thread.. It is having more than enough info.. Refer the snap of Last Academic year admission notice for your reference. Thanks, Bala. Hi frnds, any idea about the issue date of application form? ??? If any body have the contents of track sheet just upload it frnds..
Hi I am looking for joining my kid in psbb k k nagar this year . She is two and half now . We are now in nanganallur . If we get admission we are planning to shift house near k k nagar . Will it be a problem to get admission in k k nagar branch ? Also when can we expect online applications ? 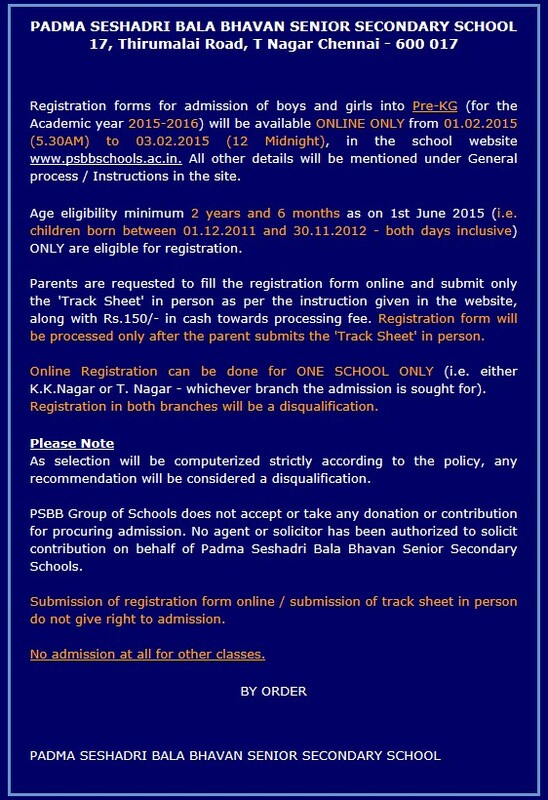 Ok. Did any one submit PSBB Millennium online application now? Do you mean physical form? Thanks sundar.. for bank passbook would they look at the date of opening..?? 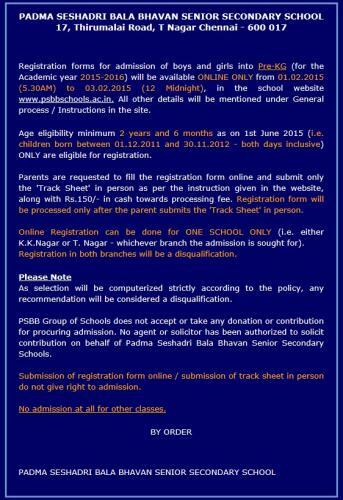 Hi when it will start admission process for PSBB KK nagar branch? I want to join my kid. She is 3 years old. Could you please let me know if any one have idea. Do they accept lateral entries on transfer basis? My daughter is doing her std 5 at yercaud and we are plng to bring her to chennai next academic year .not sure how easy it is to get admission for std 6. Accordingly we have to shift our house from Tambaram.